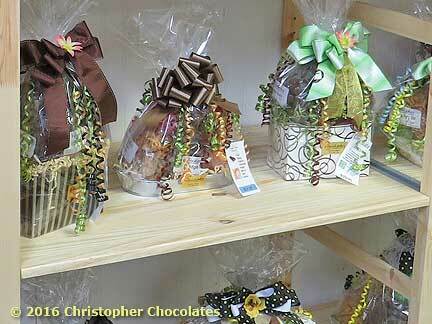 Christoper Chocolates - Newtown Square has the Best Gift Baskets in the area! It seems no matter how many I might have, there is always a use for another. Looking for the perfect Local Gift? Our gift baskets are the BEST. They are hand packed, individually decorated plus a handmade bow to fit the occasion or holiday. Each gift basket is unique and bursting with food and flavor! One of the oldest human inventions and to this day still among the most useful. Always great intersections of art & design and always there to keep things together. And when they arrived from a friend or loved one LOADED up with AMAZING foods and snacks from Christopher Chocolates, the delight will be savored. We also need to mention that while others may offer gift baskets, many products out there feature lightly filled boxes with lesser quality products. We don't play that game, our baskets are always packed full of highest quality treats and snacks that will be appreciated by all. Check out examples from our Elite Collection of Gourmet Gift Baskets. What do you add to make any event even more special? A bit over the top but perhaps that is just what's required! A Christoper Chocolate Premium Gift Basket features an extravagant assortment of various themed products all nested securely in top-quality handmade decorative utility baskets. Note also that when we prepare a basket we can customize some details to your exact liking. Wether through the personal selection of satin and decorated ribbon elements or highlighting specific products from our immense arrangement of candies, chocolates or other snacks. 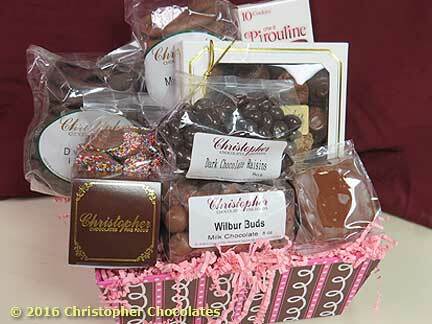 When it's time to entertain, Christopher Chocolates is there. 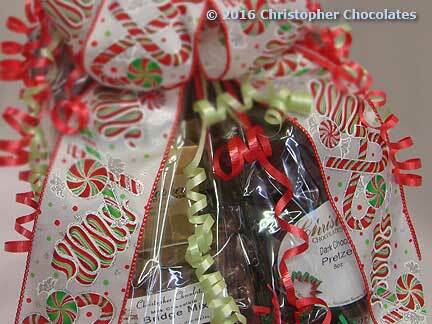 Our Holiday themed gift baskets will get their attention and keep everyone coming back for more. These gift boxes aren't at all your “standard-faire” so expect to be as pleased with the quality featured as well as the quantity we can fit into any of our custom basket assortments. To every season, a basket. A handy basket for around the house in the Fall, maybe the hot chocolate featured in our Winter theme basket, or something more floral in Spring, even perhaps one with a sturdy metal pail or beach carry-all for Summer (great for gardens and gourmets alike!) We have gift baskets prepared for every season. After all, this is the perfect gift year-round. Regarding decorative motif and seasonal content we develop new and unique baskets every season so it's easy for you to show up with something perfect that recipients will remember long after the season (and snacks) have past by. Learn more about our Seasonal Gift Products here. Credit card orders are welcome. Our Gift Baskets are hand-packed and cello wrapped. Handmade bows and individual decoaryions are added to the fit the occasion or holiday. Each basket is unique! 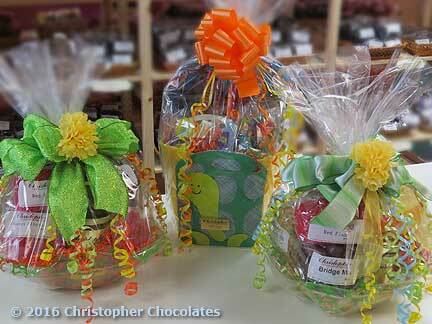 Select your favorite goodies and wrap them in one of our hand decorated baskets. Any Price Range Available. You Asked For It...Our Christopher Assortment, Bridge Mix, Fudge, Truffles, Chocolate Pretzels, Chocolate Chip Cookies and more. ALL Chocolate, All in One Great Gold Box. Milk & Dark Chocolate Pretzels, Dipping Pretzels & Diiping Mustard, Peanut Butter Pretzels and more Pretzels! Our quality chocolates are the best that money can buy! We offer a large variety of Chocolates and Truffles that can be custom packed to your specifications. A Taste of Everything! Milk, Dark or Assorted. Milk or Dark, Mini or Regular, Mini Dark Mint: $7.95 /8oz. Milk or Dark: $7.25 /8oz. Chocolate, Vanilla, Chocolate Nut, Vanilla Nut & More: $9.95 /1lb.